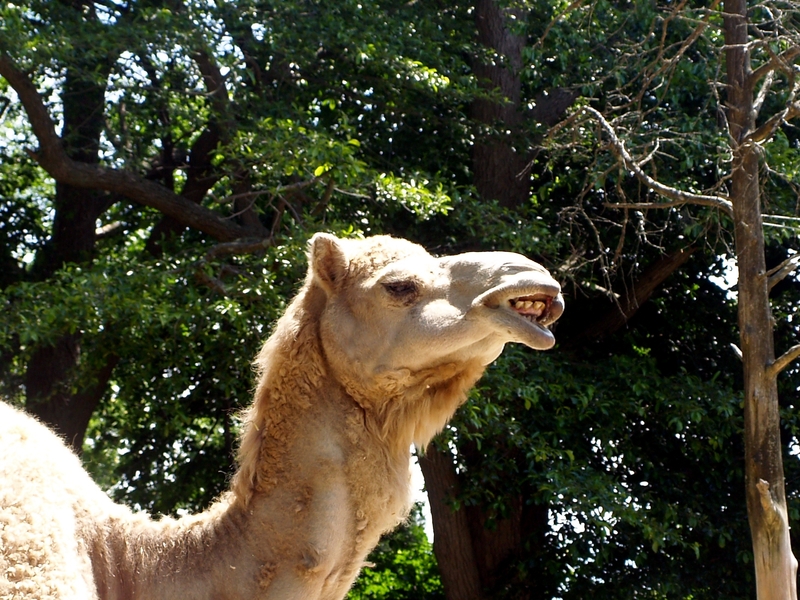 Dromedary Camel (_Camelus dromedarius_) at Roger Williams Park Zoo. My younger and more naïve self was under the impression that camel mouths housed an irregular mess of pegs and spikes, not unlike a certain national stereotype. Camel dentition is more orderly that what brief glimpses into their mouths suggests but, as usual, they’re still really really weird. _Camelus_ sp. at Harvard Museum of Natural History. 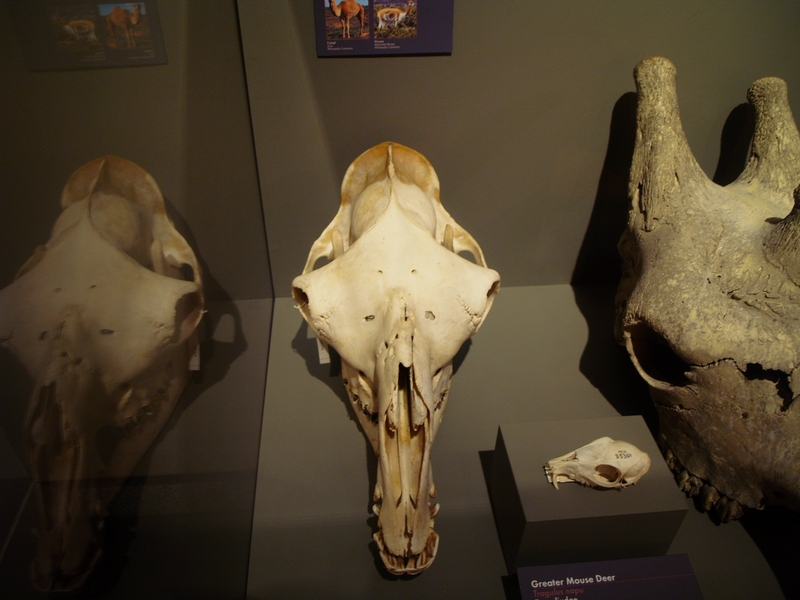 First off, is it me, or does this dorsal-ish view of a camel skull make it look weirdly Basilosaurus–like? This is giving me bad ideas for highly unconventional reconstructions. Anyways, this view demonstrates that spatulate incisors are located only on the mandible and that there are well-developed canines. Pronounced canines are not unique among artiodactyls – note the Greater Mouse Deer to the right – but camels are remarkable for having additional canine-like teeth. Lots of them. 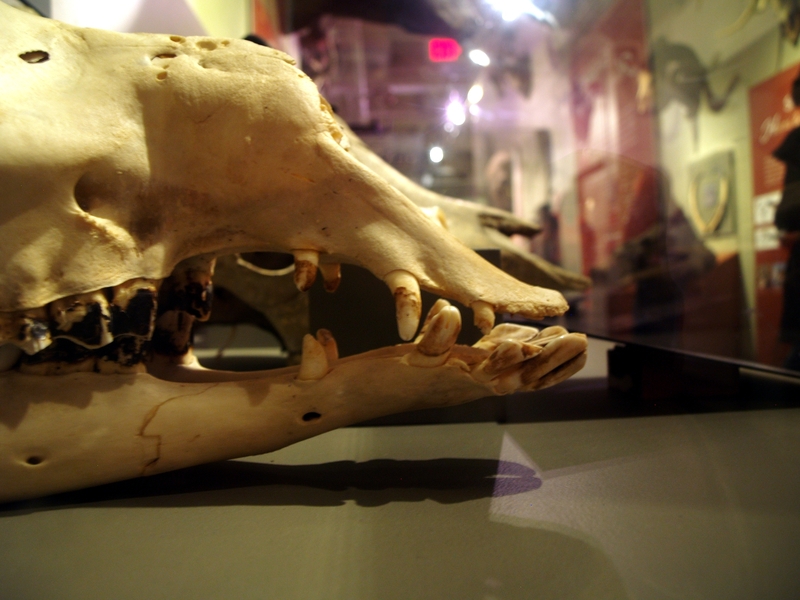 After the true canines in both jaws are caniniform first premolars, and before the canines in the upper jaw only are caniniform incisors (Fowler 2011). As for what these teeth are used for, the true canines are most developed in males and apparently adaptations for intraspecific aggression (Fowler 2011). Camels also bite humans – sometimes fatally – and bite marks on extremities leave a distinct “4 dot sign” (Abu-Zidan et al. 2011), which suggests at least one of the other pairs of caniniform teeth can be used to inflict damage. This Linnaeus’s Two-Toed Sloth (Choloepus didactylus) is kindly demonstrating the suspensory locomotion that extant sloths (Choloepus, Bradypus) typically engage in. 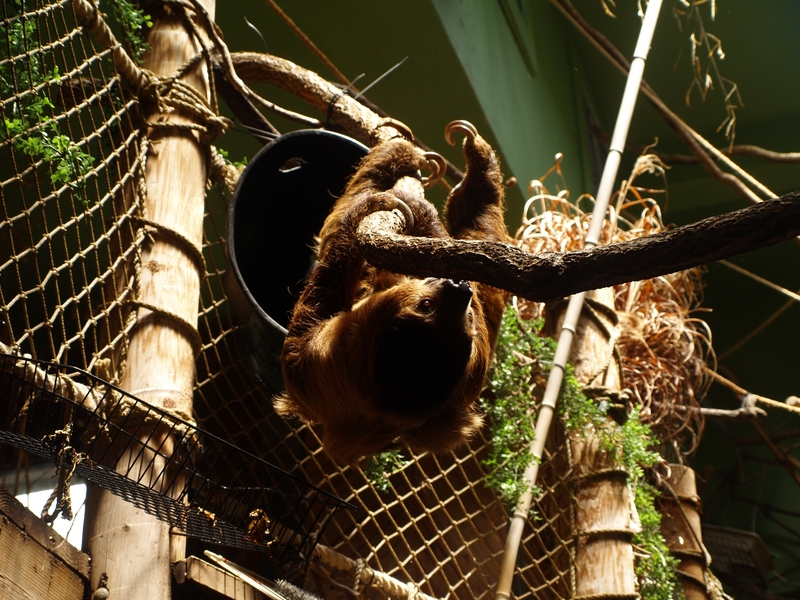 Two- and Three-Toed Sloths are distant relatives and since no known fossil sloths were suspensory, this suggests the unusual method of locomotion evolved convergently (Pujos et al. 2012). As for how the 400+ extinct sloths got around, it was much more variable than the “ground sloth” label implies; some burrowed (Scelidotherium, Glossotherium), had some bipedal capability (Megatherium), were tree climbers (some Antillean species), rock climbers (Diabolotherium), and even aquatic and semi-aquatic (Thalassocnus) (Pujos et al. 2012). In the last post I observed that the horrendously awkward drinking stance of Giraffes isn’t due to neck inflexibility but rather proportionally very long legs. When drinking, Giraffes appear to hold their necks at around the same angle as those of other ungulates (to be on alert for predators?) and I managed to photograph one individual bending its neck down at a more extreme angle for no clear reason. Giraffe necks are most certainly not rigid beams which can barely flex downward from the familiar browsing posture, and the contortions they can achieve are astonishing. 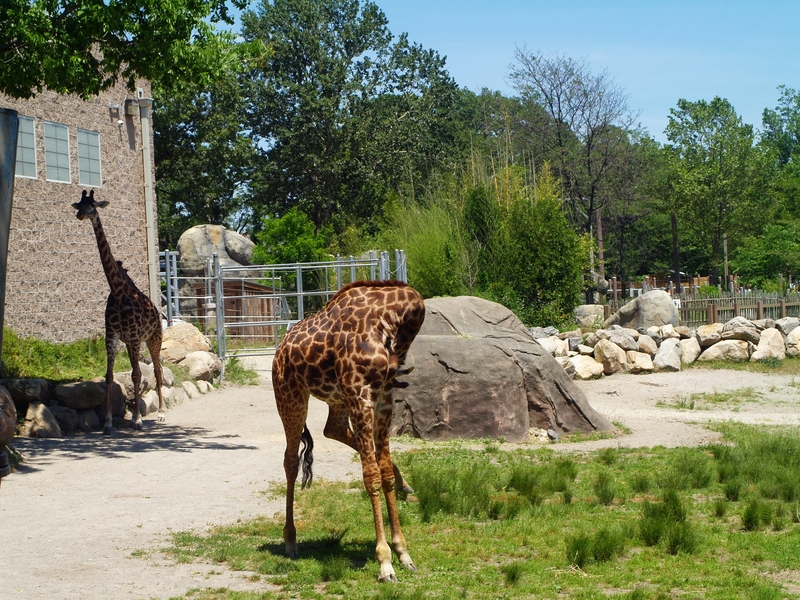 Masai Giraffe (_Giraffa tippelskirchi_) at Roger Williams Park Zoo. For an animal with seven elongate neck vertebrae, this is a pretty impressive arc. It also makes me wonder if autogrooming is an overlooked behavior in extinct long-necked animals – I don’t think I’ve ever seen a reconstructed sauropod engaging in such behavior. The sharp bend in this Giraffe’s neck is truly ridiculous – a better angle of the same posture shows just how sudden and extreme it is. Are Giraffes seriously capable of a 90 degree bend between two cervical vertebrae? 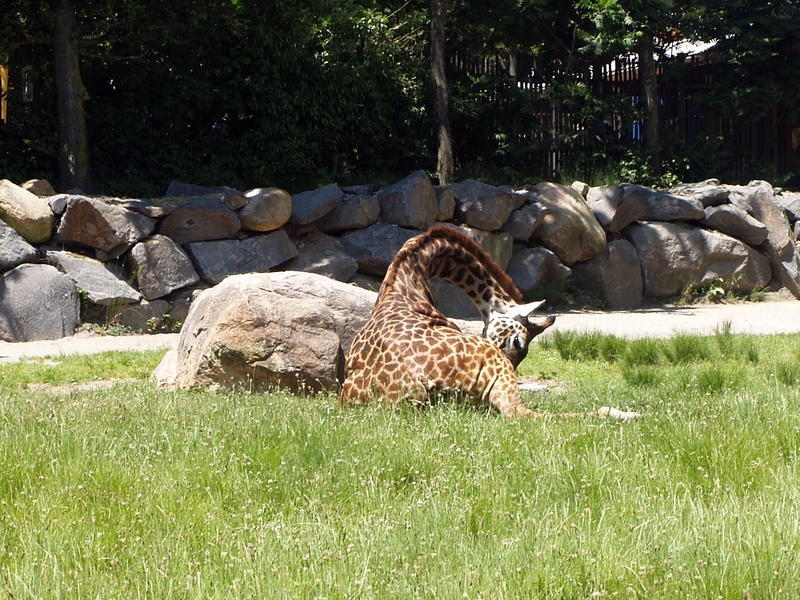 I’m fairly certain I did not observe the absolute extremes of Giraffe flexibility and I’m curious just what their limits are. I must point to SV-POW!’s dissection of a baby Giraffe neck which revealed nearly one fifth of the length was from cartilage. Adults are presumably less extreme than this, but still, wow. I suspect many people are under the impression that Giraffe necks are rigid beams which can barely bend down enough to allow the poor hyper-specialized creature to drink. Angolan Giraffe (_Giraffa angolensis_) and Black-Faced Impala (_Aepyceros melampus petersi_) at the ol’ watering hole. From Wikipedia Commons. A bit of behavioral comparison suggests that Giraffes have roughly the same neck posture as other ungulates while drinking and that the horribly awkward stance is due to the legs being very long proportionally, even more so than the neck. 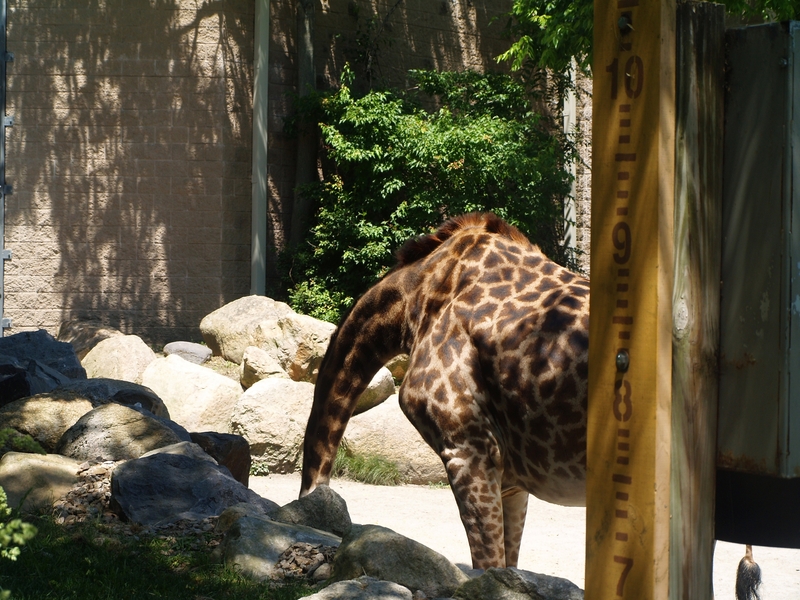 As for whether or not Giraffes can bend their necks further down than their drinking posture, yes, they can. As for whether or not this Giraffe managed to get its mouth to the ground and why it would place such a strain on its nuchal ligament, rete mirabile, and who knows what else, I really don’t know. This was a young individual, so perhaps it was just playing around and exploring its limits. I did observe other neck-related wackiness in this individual, but that’s a story for another day, probably tomorrow.